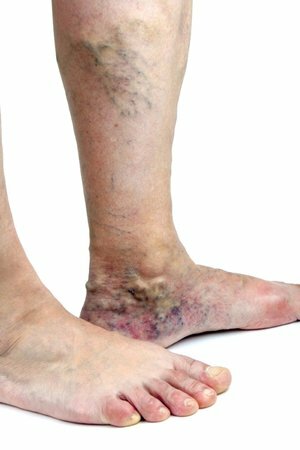 How are these types of vein problems treated? These specialized stockings put firm pressure on the legs, compressing the veins. There are three main varieties. Support hose provide the least amount of pressure.Support pantyhose, which offer the least amount of pressure. They do not provide pressure in the areas where it’s needed most, instead providing an overall pressure which isn’t as effective as targeted pressure. Over the counter (OTC) compression garments, which give more pressure yet still don’t provide it in a targeted manner. These can be bought in drugstores or medical equipment stores. Full strength prescription graduated compression hose. These can be prescribed by a podiatrist or medical doctor, and provide the targeted pressure which the other two varieties can’t. Patients must be measured to ensure a proper fit and level of compression. 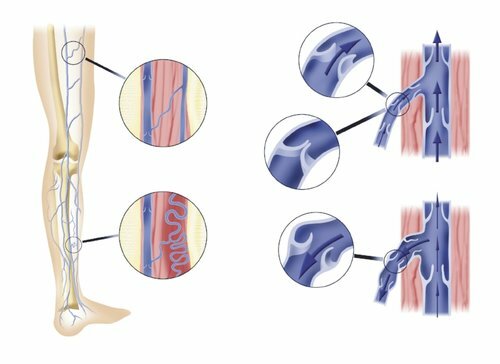 This type of surgical procedure excels at treating the deeper veins which ultimately cause both varicose and spider veins, and are responsible for the majority of symptoms associated with these conditions (achiness, pain, swelling, heaviness, fatigue, and other less common symptoms). These are inpatient procedures which take about one hour, are well tolerated, and can treat even the most severe vein disorders. A specialized catheter with a heating element at one end is threaded into the vein. Once placed into the length of the vein, this tip is activated as the catheter is withdrawn. Once heated, the vein walls are irreparably damaged, and the vein collapses in on itself and is permanently shut. As with other techniques, the vein is then absorbed back into the body as part of the natural healing process. Only local anesthesia such as lidocaine is necessary. This type of procedure is rapidly becoming the gold standard in vein treatments. The blood which was travelling in the diseased vein is immediately rerouted into nearby healthy veins, so circulation is actually improved. Varicose veins and spider veins which were being fed by the treated vein no longer have a blood supply, and tend to shrink but not disappear completely. Any remaining surface veins can be “cleaned up” using sclerotherapy and laser treatments. a.k.a Ambulatory Phlebectomy. This approach physically removes larger surface varicose veins. Tiny incisions are made over the vein which will be removed, and small surgical hooks are used to pull the vein from beneath the skin. This procedure sounds rather severe, yet in practice is tolerated very well and isn’t considered an invasive procedure associated with long healing times. Only local anesthesia is needed, and this type of surgery can be performed in your surgeon’s office, not in a hospital operating room (OR). Unless the area being treated is extensive, only one appointment is usually necessary. Even the largest veins can be removed via microphlebectomy, and there are rarely unwanted adverse effects. Only mild bruising and pain which can be easily treated with over the counter drugs like ibuprofen are to be expected. Scarring is minimal or non-existent. 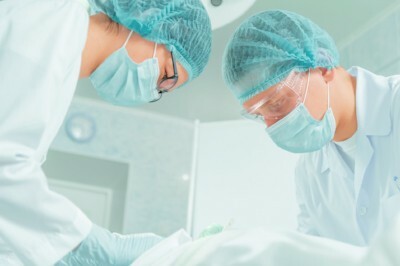 Surgery is only used to treat very severe cases, and only as a last resort. Increasingly less invasive methods are sufficient, including the ablation technique described above. The risk of breathing problems which can occur with any general anesthesia. This is why an anesthesiologist must be present. Post surgical bleeding, which usually resolves on its own but may require follow up treatment. Incision infection, which is easily treated with antibiotic drugs. Permanent scarring, which is not uncommon with this invasive approach. Nerve damage around the veins which were removed. This can cause changes in the sense of touch, numbness, tingling, or other altered sensations. This usually isn’t permanent and resolves on its own. Deep Vein Thrombosis (DVT). This is a potentially life threatening complication when any vascular surgery is performed. This type of blood clot can break loose from the vein wall and travel to the lungs. Fortunately this can be treated with clot-busting drugs sugh as heparin, yet these must be administered carefully as they can create unwanted bleeding and large amounts of bruising.